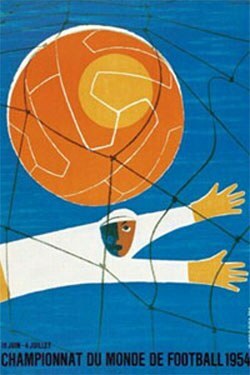 The 1954 FIFA World Cup took place in Switzerland 16 June to 4 July. In total, 16 teams participated in what was the final stage of the tournament and 26 matches were played. It was the fifth time for the World Cup tournament and it would be the first that could be seen on television. The defending champions Uruguay were among the teams; their national side had so far won the tournament in every attempt. It was, however Hungary, the big dominant in European football at this time, that arrived in Switzerland as the biggest favorite. One of their players was the legendary Ferenc Puskás who was injured against West Germany in the group phase, but would recover for the knockout stage. Notable was also that Scotland, South Korea and Turkey all had managed to qualify for the World Cup final for the first time (the former great power in football, Scotland, had only been a member of FIFA since 1949). Germany that had been forbidden to participate in the previous World Cup due to the actions in World War II was again welcome in the FIFA World Cup. The atmosphere in Switzerland was completely different from what it had been four years back in Brazil. It was a rather big contrast to the passionate audience that had filled the enormous Maracanã. It may seem strange that such a small country as Switzerland would be the host for the biggest global football tournament in the world, but it was one of few European nations that hadn't been particularly affected by the recent war. The format was a first phase with four four-teams group from which two teams would advance to a final knockout stage. A curious thing with the set-up for this tournament was that every team only played two group matches, and would only meet two out of three teams. Ranking would decide which teams that would meet. Unsurprisingly, the design would be criticized. Criticized was also the idea that no concern would be taken if a team had come first or second in the group when the teams were assigned opponents in the Quarter-finals. This resulted in that a very plausible final would come off already in the Quarter-finals between Hungary and Brazil. The matches would be played in six cities and at six stadiums (see “Cities and stadiums” box for overview). The Wankdorf Stadium in Bern had the biggest capacity with places for over 64,000 and the final would consequently be played here. The tournament would achieve the highest goals average ever in a World Cup with an astonishing 5.38 goals per match. Most excessive production of goals at all would come about in the Quarter-final game between Austria and Switzerland: 7-5 after 90 minutes (12 goals in one match are still a record in the tournament). Another reason was the South Korean negative record with 16 goals forfeited. Over five goals per match had never happened before and it will certainly not happen again. In the Quarter-finals Hungary faced Brazil in a match that was mentioned as a moral final. But the major impression of the game was not the sporting, but violent encounters on the field. The game that would be called "Battle of Berne" included three red cards, fights on the sideline after the final whistle and continued further with Brazilians attacking the Hungarian players in their locking room. 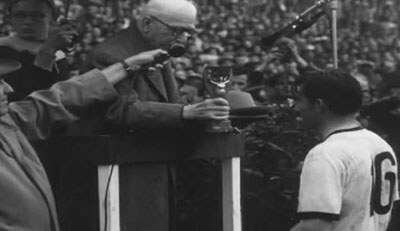 West Germany may be one of the biggest football nations, but the team in the 1954 World Cup lacked qualifications to a great degree and it was a big sensation when they won the Quarter-final against Yugoslavia. Even bigger was the 6-1 victory against Austria in the Semi-final. Despite the overrun against Austria, Germany was expected to stand without a chance against Hungary in the final. Anything else would be a miracle. Hungary would take a 2-0 lead, but German morale and a muddy pitch that wouldn't serve the Hungarian passing style made it to what ever since has been called “The Miracle of Bern”. West Germany became the winners of the tournament after beating Hungary in a tense game with three goals to two. FIFA World Cup 1954 would include 26 matches in which 140 goals were made (5.38 goals per match). Three players were sent off during the tournament. Brazil, Yugoslavia, Hungary, West Germany, Uruguay, Austria, England and Switzerland would advance through the group phase to the knockout stage. West Germany, Austria, Hungary and Uruguay would succeed in the Quarter-finals and go on the Semi-finals. West Germany would thrash Austria with 6-1 and Hungary would defeat Uruguay after extra time. The Hungarian player Ferenc Puskás would after the tournament accuse the Germans of using dope. He was forced by FIFA to take back his accusations, but 50 years later testified an attendant that he had had found syringes in the Germans locking room after the final. A study made by the Berlin Humboldt University would also later confirm that systematic doping had taken place in West Germany during a long period. The same report also claimed that the German football players had taken Methamphetamine before the 1954 World Cup final.